The U.S. average retail price of diesel froze during the week of Feb. 11, remaining at $2.966 a gallon. The price for trucking’s main fuel is 9.7 cents a gallon cheaper than it was a year ago, according to the U.S. Energy Information Administration. Diesel prices had been falling steadily since reaching a peak of $3.395 a gallon during the week of Oct. 15. Since then, there has been only one price increase of 0.1 cent, to $2.966 per gallon, which occurred the week ending Feb. 4. The average cost of diesel decreased in all regions except the Midwest, where the price rose 1 cent, to $2.849 per gallon, and the West Coast, where the price remained at $3.435 per gallon. Concerns that the global economy will slow down if the United States and China do not work out a trade agreement have contributed to keeping the price of oil relatively low. The national average price of gasoline climbed 2.2 cents from $2.254 to $2.276. On the trading floors, oil rebounded from a two-week low on Feb. 12 as Saudi Arabia pledged to deepen production cuts and President Donald Trump said he could extend a deadline for new tariffs on China, according to Bloomberg News. West Texas Intermediate crude for March delivery rose 69 cents to $53.10 a barrel at the official closing of the New York Mercantile Exchange on Feb. 12. But Cinquegrana said oil has been stuck in a range of between $50 per barrel and a recent high of about $57 per barrel. Absent a large catalyst, such as an agreement between the United States and China or deep cuts from OPEC, oil will likely stay in that range, Cinquegrana told Transport Topics. Keeping global prices lower has been U.S. production, which has seen vibrant production in Texas and North Dakota. Cinquegrana said if oil prices do go higher, it will stimulate further U.S. production, leading to perhaps a record 13 million barrels a day. That’s an outlook that the EIA shares. On Feb. 12, U.S. crude supply was projected to average 12.41 million barrels a day in 2019, and 13.2 million barrels in 2020, according to the EIA. Recent data from Texas alone back up Cinquegrana’s theory of booming U.S. production: The Texas Independent Producers Royalty Owners Association reported the Lone Star State produced 1.54 billion barrels of oil in 2018, about 4.2 million barrels per day. That beats a 1973 record as the all-time high. Cinquegrana told TT that U.S. production could slow down if the dollar grows stronger, as commodities tend to trade lower with a strong dollar. More interest rate hikes from the Federal Reserve could also slow down speculation, thus driving oil prices lower, he said. 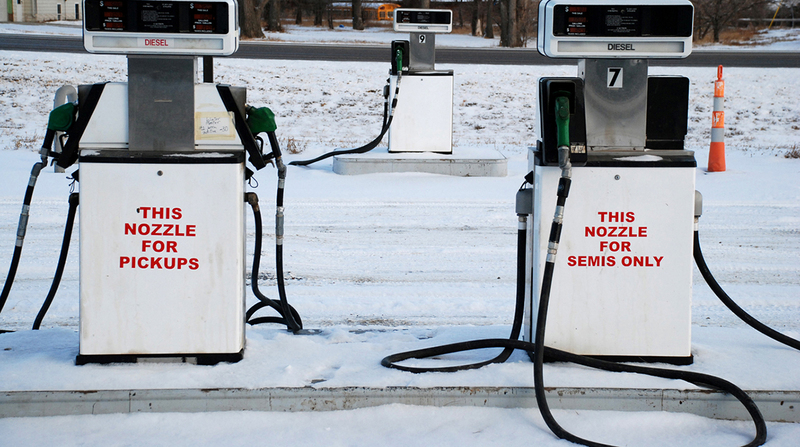 Since fuel prices are always prone to these kinds of swings, fleets must constantly look for ways to conserve fuel. To help its customers, leasing and rental firm Ryder System Inc. offers a variety of technologies on its trucks that are designed to help, including automatic tire inflation, said Chris Nordh, Ryder’s senior director of advanced vehicle technology and global fuel products. “The system offers a combination of fuel-efficiency advantage ... as well as peace of mind when it comes to on-time deliveries and minimizing downtime issues due to tire breakdown events because of underinflated tires,” he said in an email to TT. Nordh said Ryder offers other options, including automated manual transmissions, roll stability control, forward-looking radar and collision mitigation systems, all of which it believes, “could all lead to better driving behavior and fuel economy,” Nordh said. But he noted that drivers are the top factor for conserving fuel. “Drivers are the No. 1 contributor to fuel savings as they ‘man the ship’ and make decisions on the road as it relates to fuel purchases,” Nordh said.